Drain & Sewer Cleaning in Buffalo, North Tonawanda, & Nearby! Drains Backed Up? Sewer Problems? A video camera helps us accurately asses your drain or sewer. No matter what's causing your drainage clog or problem—a corroded or collapsed pipe, a roaming tree root, a huge frost heave—Frank's Mr. Plumber will fix it fast and fix it right the first time. drain clean is our business! 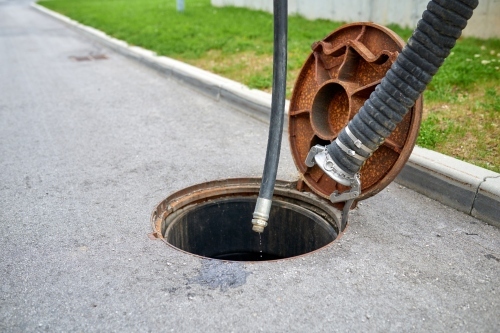 And if needed, we can replace your main underground sewer line without destroying your property. We can handle the entire job—from excavation to materials to permits. Expert sewer cleaning-we can clear, repair or solve your sewage problems. Frank's Mr. Plumber is your Greater Buffalo septic and sewer cleaning expert. Our special Sewer Camera goes right into the drain line so you can see the problem. There is absolutely no guessing as to what the problem is and where it is located. With our modern Water & Sewer Line Replacement Equipment, we can replace your water & sewer line without destroying your front lawn. This method can minimize lawn, driveway, sidewalk and landscape damage to your property. The job can be done in less time, with a lot less aggravation. In Western New York, Frank's Mr. Plumber serves Buffalo, Lockport, Tonawanda, North Tonawanda, Niagara Falls, Lancaster, Hamburg, Amherst, Depew, Grand Island, Orchard Park, East Amherst, East Aurora, Grand Island, Lewiston, Getzville, Clarence, Lackawanna and nearby areas.